The File Sent Message window prompts you for what you would like to do with the message you are sending. You will notice that this window is similar to the QuickPick Window in the way it operates. In particular, see Finding Folders for a description of how to quickly find the right folder in the folder list. If you prefer that SimplyFile not prompt you for every sent message, you can disable this prompt in the Options Window. Send the message and file it in the folder you select in the folder list. 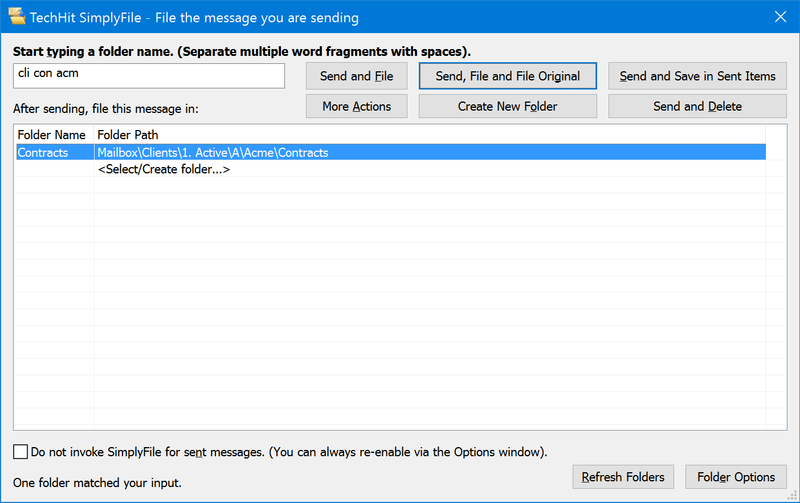 You can save a copy of the message in the Sent Items folder in addition to the folder you specify by enabling this option. Send the message and file it in the folder you select in the folder list. Also file the message you are replying to in the same folder. You can use this option to make this button the default button of the window. The default button can be invoked by hitting the Enter key. Send this message and save it in Sent Items folder. This is the default Outlook behavior, which is what you are used to having without SimplyFile installed. Send this message and do not save a copy anywhere. Good for those “thank you” messages or when you are sending a huge attachment you do not need to keep a copy of. See the description of this command in the QuickPick window. It works the same way. A combination of Send And File, followed by TaskIt. This is a great shortcut for creating a follow up reminder about a message you are sending. Example: You are sending a message, asking someone to get back to you by next Tuesday. Use this command to create a reminder for yourself to check whether you received a response.